Contributed by Thrums Books. Read the original feature in Hand/Eye Magazine. Author Susan Schaefer Davis acknowledges in the introduction in Women Artisans of Morocco: Their Stories, Their Lives there are numerous books about Moroccan craft with a focus on textile and fiber art, but none of these other books cover the women behind the craft and who have dedicated their lives in producing the highly coveted textiles while at the same time taking care of their homes and their children. 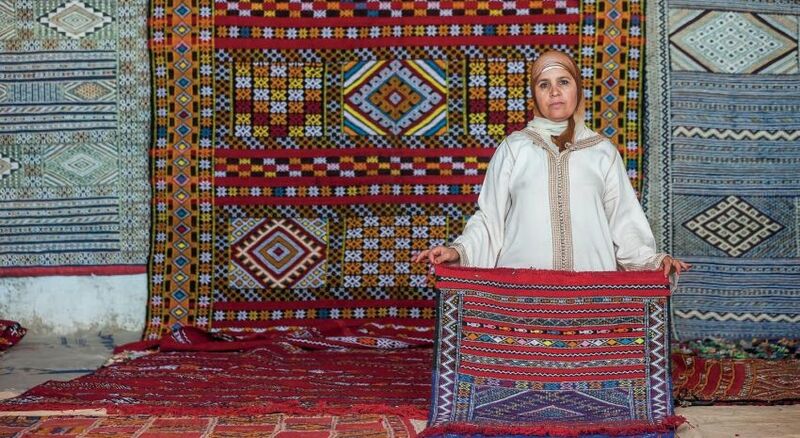 Davis introduces readers to more than 20 women whose skills and designs vary from several regions within Morocco. She examines both their work and their lives and how the relationship between craft and their role as women has evolved in the 21st century. 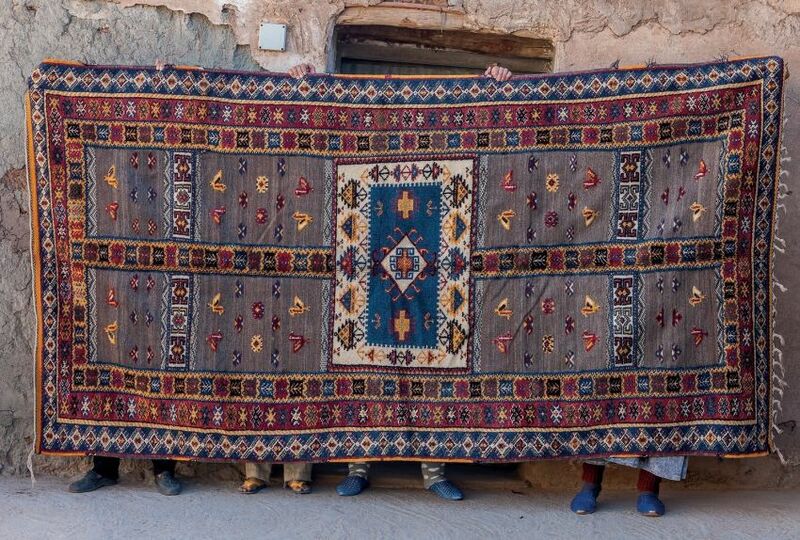 Many of the profiles are of rug weavers who continue to use skills that have been brought down by generations but vary greatly within the different regions in Morocco. Davis provides introductory historical and cultural background accompanied by Joe Coca’s spectacular and opulent photos that include expansive vista shots, a horse competition with the horses decked out in their own textile finery, but it’s the images of the women and their work that take your breath away. Davis travels through the different regions and takes the reader through a magnificent and unforgettable journey. We get the opportunity to see where the women live. We first meet Fadma Wadal who lives in the remote village of Zawiya Tidgheste, south of the Atlas Mountains. The village is located right on the edge of desert country. Fadma is a storyteller, sharing stories of her days working as a sheperdess. It was while on her watch she learned to card, spin, and weave. Each chapter provides ample information of the individual craftwork with photographs that show the intricate detail of their art. Readers will be drawn by the daily routines of these women artisans as well as their entrepreneurial spirt. 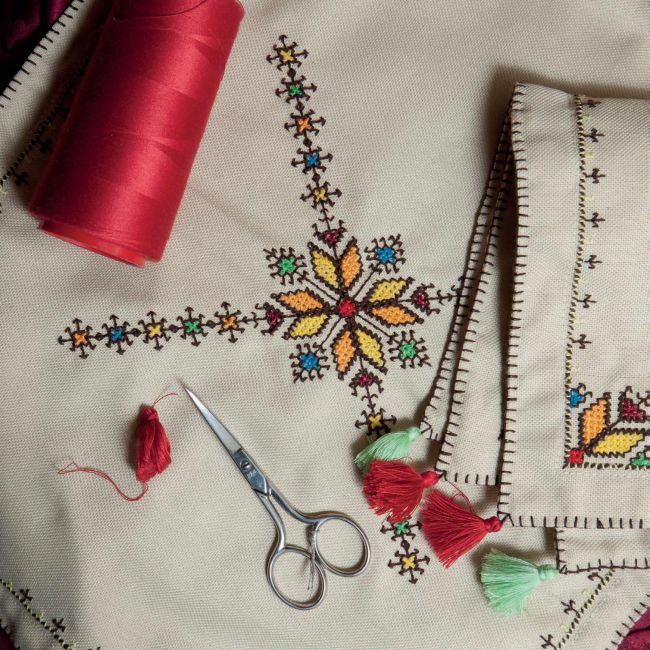 In a time when women’s voices across the world are louder and clearer, Women Artisans of Morocco: Their Stories,Their Lives is an important volume for anyone interested in textile traditions and in the lives of Muslim women. To purchase Women Artisans of Morocco: Their Stories, Their Lives, visit Amazon.com.